What happens with a stretch of sunny winter weather; the Olympics on television day and night; a flag; and a provincial holiday weekend? Skating and pond hockey. In the past couple of days, we headed out to our local ice and took along our sticks for a family game. A few pictures from our pre-game warmup. They wanted faceoffs! Here you go girls. Just a beautiful set of days in our neck of the woods. Rebecca had a few practice moves as well. We are lucky to have a nice spot so close by. Our kind of family photo. We decided to stick around our own wintry New Brunswick for March Break this year. We had an eventful week with a hike, two days of skating and a trip to Fredericton to a ‘science museum’. Our hike was to the Parlee Brook Amphitheatre Ice Falls near Poley Mountain. The girls enjoyed the 4 hour return hike in beautiful weather and incredible ice scenery. It was my third of 40 this year. Our skating adventures were on two radically different temperature days. One was just above zero, the other about -12. Needless to say, the ice conditions were amazing at our neighbourhood ‘pond’. The ice was as clear as the water in the summer time. Abby loved sliding down the banks onto the ice. During our ‘rain day’, we drove to Fredericton for a 3 hour visit at Science East. The girls spent the time exploring different experiments demonstrating all sorts of science facts and themes. Their favorite was a wall painted with phosphor, which held the illumination of a flashed light for a short period of time. Rebecca was also picked for a ‘hoverboard’ demo as part of learning about gyroscopes. During our Christmas and New Year break, we had some fun with family and friends. The girls had a visit from their Aunt Laurena and also took a trip to Resurgo Place, a museum in Moncton, where we all met with friends and cousins Karen and Kelly. 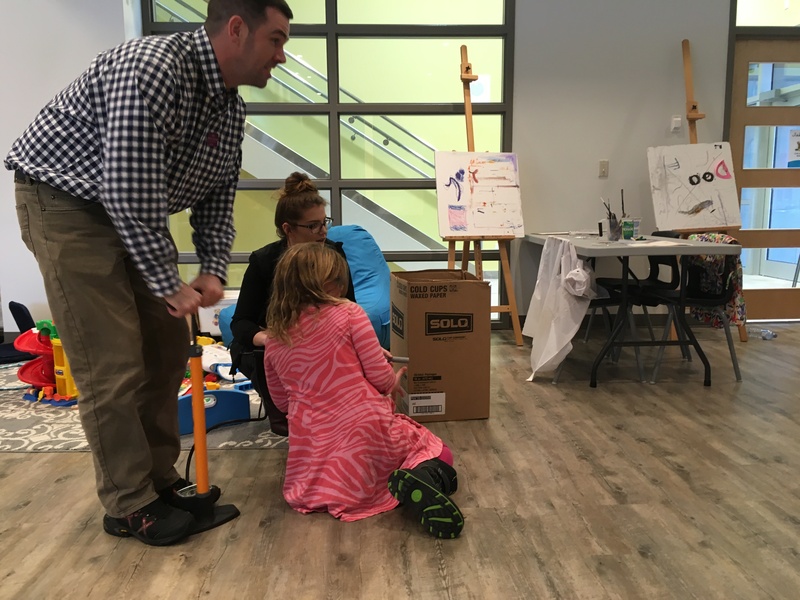 The museum has neat learning play stations, where you can try out experiments and inventions, plus the usual exhibits. 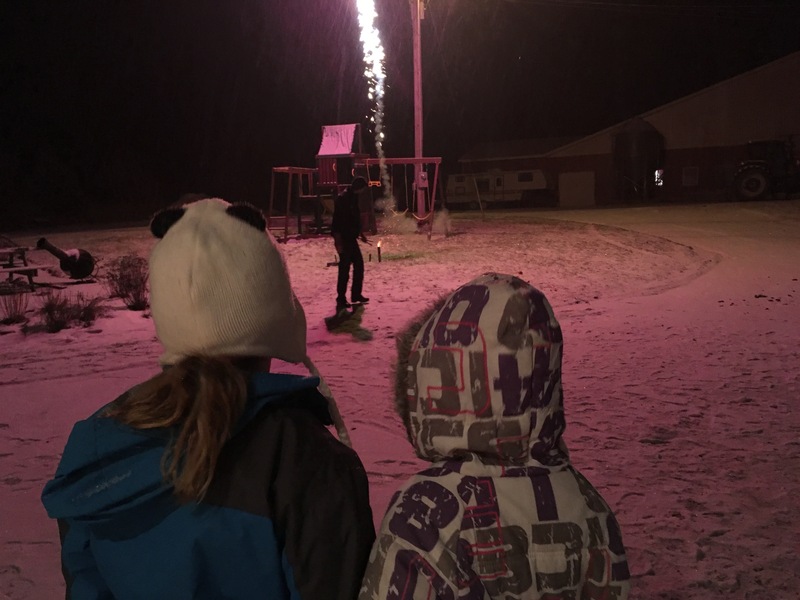 New Years was a great time for the kids. They were invited to their first New Years party and got psyched up with New Years movies and music before going. The midnight fireworks were a big hit — for some more than others! 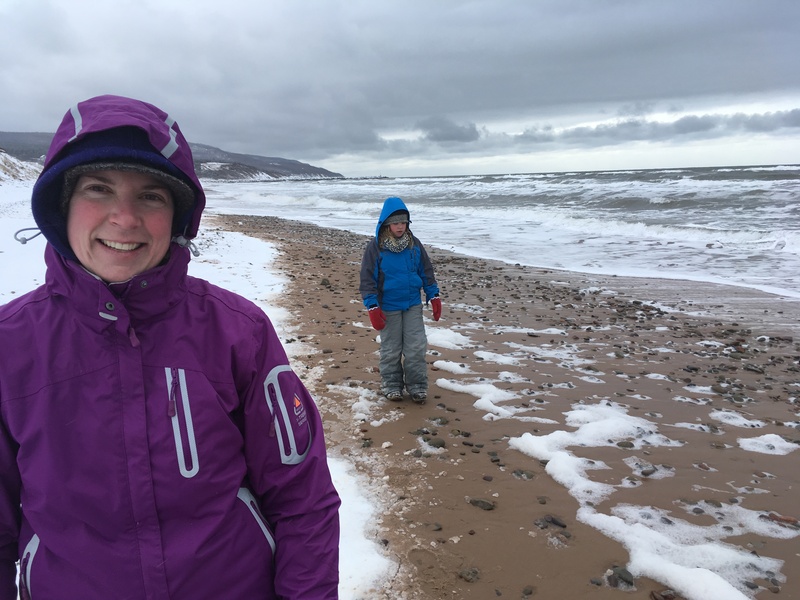 We also took a trip to Cape Breton between the snow storms after New Years. It was a short trip, but we were able to catch up with the grand parents, spending a few family days packed with activity. The big hit was The snowstorm day where we spend time playing games, watching movies, sledding, ‘belated Christmas dinner’, snow wrestling and more silly games! 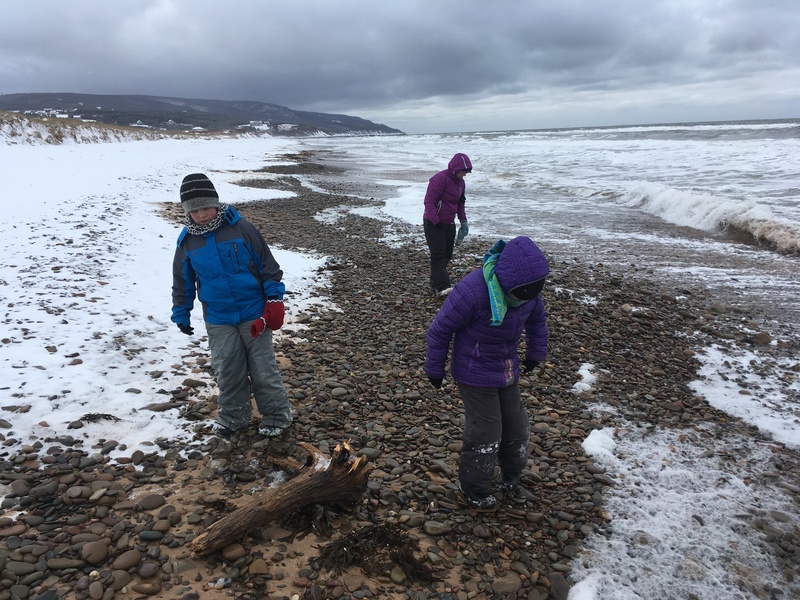 Of course the beach combing in winter was our outdoor highlight. I took a 11 kilometre snowshoe hike on my birthday as part of my 40 at 40 challenge this year. Sheena gave a gift of hikes to me, and I just have to do them! I’ll post more details on each one as I knock them down. The first was in Wagmatook, Cape Breton. I hiked in 3-4 feet of snow to the Humes River, in search of Humes Falls. I did lose the trail near the end and without map or GPS, decided to turn around as it was getting late in the day. Poor Willow was tired , not to mention her owner too. A retry will be necessary. 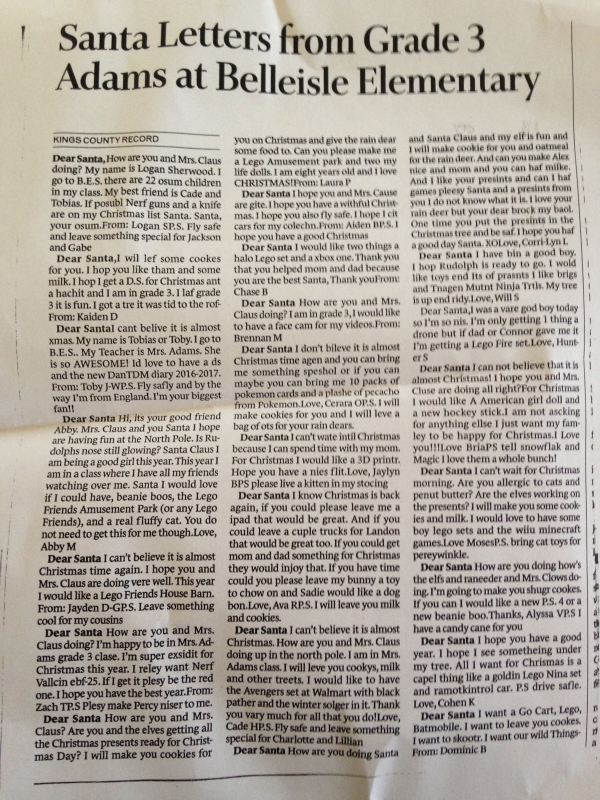 Abby's is from the Sussex newspaper, which features letters each year. Look for hers on the middle left. 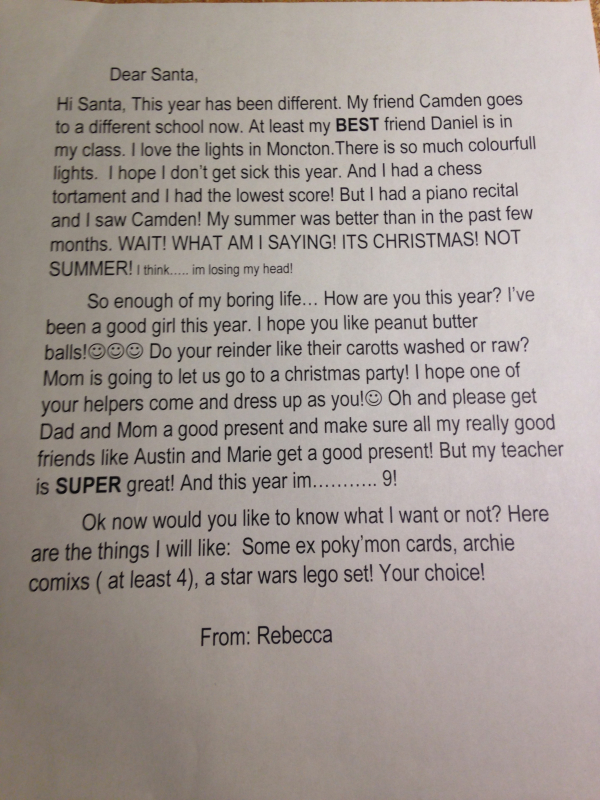 Rebecca typed hers at school. Seems like time is moving along really quickly this year. We’ve already reached and passed first report cards for Grade 4 and Grade 3. Both girls did really well and had great reports from their teachers during Parent/Teacher meetings. I asked if Rebecca could take a picture with her 3D printer in her class — as its been the source of much dinner table discussion at home. The 3D printer is in the background at right. The green cup creation is a product made by the class. We seem to hold true to our traditions each year at Christmas time, which means we’ll have Hallmark Christmas movies playing around the third week of November, attend the Santa/Christmas parade in Moncton, our own house decorated for the Christmas Tree Party we host every year and our own Christmas Tree ready to go the week after. Sheena’s mom always enjoys when the kids come to their house and decorate their tree. Here’s Abby with a few smiles and getting into the spirit. 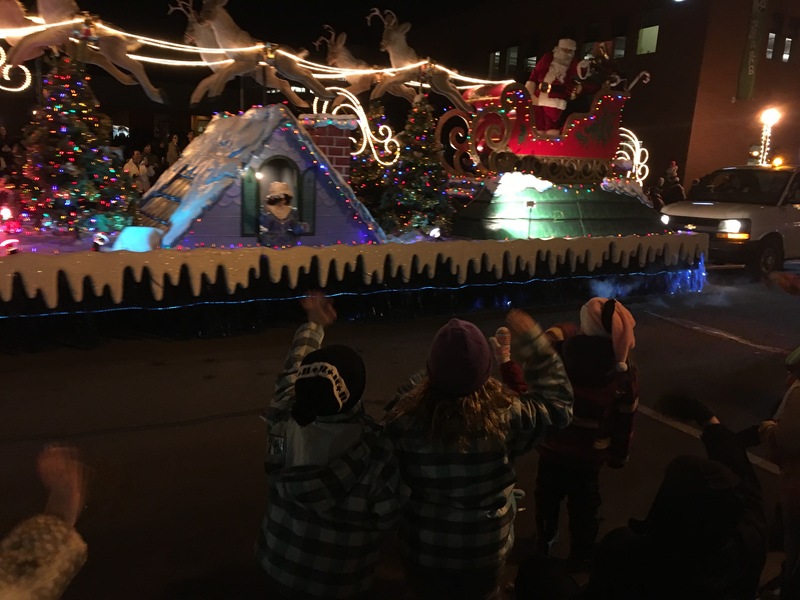 We’ll usually time our trip to Moncton for the Christmas Parade. You can’t beat their floats, marching bands, animals and the crowds for the event. It was one of the nicer ones we’ve been to this year and with fireworks no less! I snapped a quick photo of the kids waving to the man in the red and white suit at the end of the parade! Both were quite excited to see him after an hour watching the others go by. We were introduced to winter this year in one swoop of snow overnight. We lost power overnight during this storm and had about a foot of snow to play in, ripe for making snowmen and forts. It seems to have stuck around as well for the Christmas Tree party, which we had this weekend. Everywhere else in the area has brown grass still! With Christmas also comes Rebecca’s first piano recital for the year. This year, she played ‘We Three Kings’ and did very well playing in front of the crowd. Here's our yearly photo of Rebecca and Abby heading off to school. 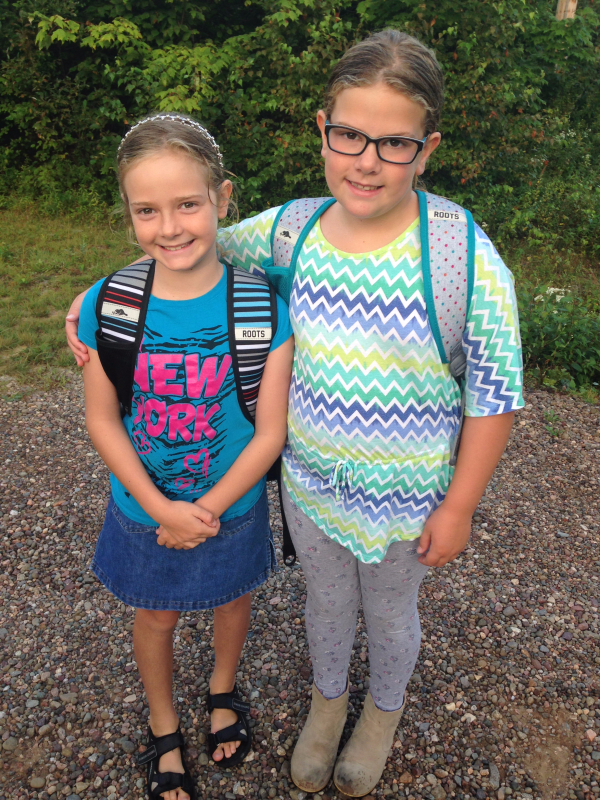 Rebecca is in Grade 4 and Abby in Grade 3. They're quite independent now and Sheena and I reflect on how far we've come from daycare to them growing into little ladies. Rebecca is still interested in piano and chess and will be doing both again this year. Abby is starting chess too and has been interested in helping out with horses at a barn nearby. Hopefully we'll be able to make that happen soon! Both have been doing a 'kid fitness' class at the Sussex Civic Centre after school a few days a week. With the fitness class, they enjoy the chance to do circuit workouts, runs, yoga, track and field and other sports. They usually finish the afternoons off with a swim. It's great how confident it has made them about their own fitness. Abby is also a non-stop biker. If her bike is around, it is not unusual for her to spend any spare time at home going up and down the driveway, even before bedtime. Hard to say no to that! The ladies have been busy these past couple of weeks and did a couple of runs in the area. 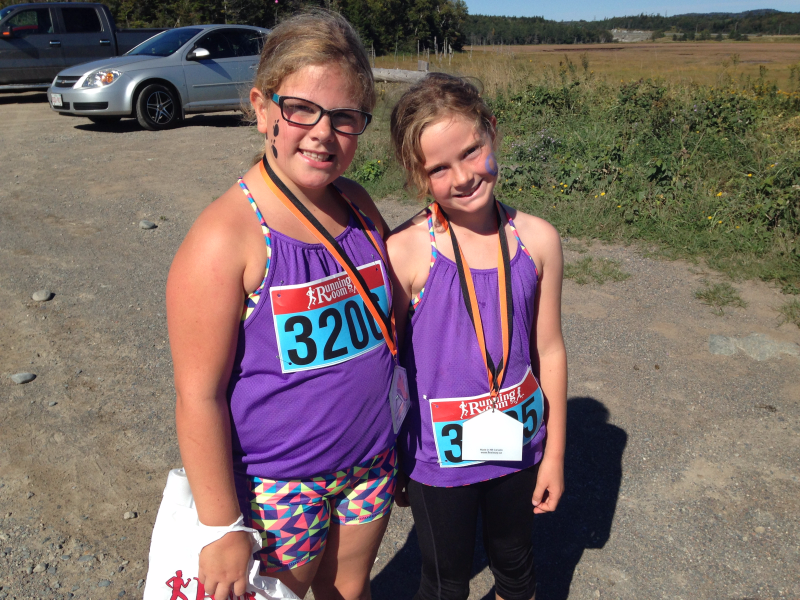 Here they are at a fun run at the Irving Nature Park in Saint John. The news with that weekend was that they did two runs on the weekend, one on Saturday and Sunday. Here are both of them waiting at the starting line in Hampton. 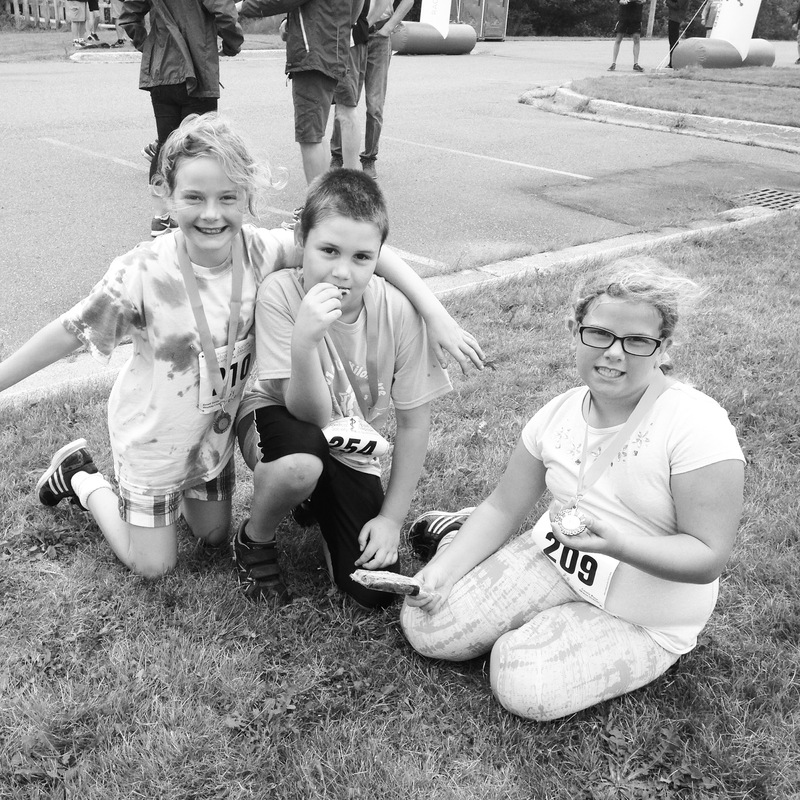 It seems that both are always excited about the medal at the end of the race and the popcicle. If a race has a popcicle or freezie at the end, they will talk about it forever! They usually also see a friend from school or make a race buddy friend during the day. 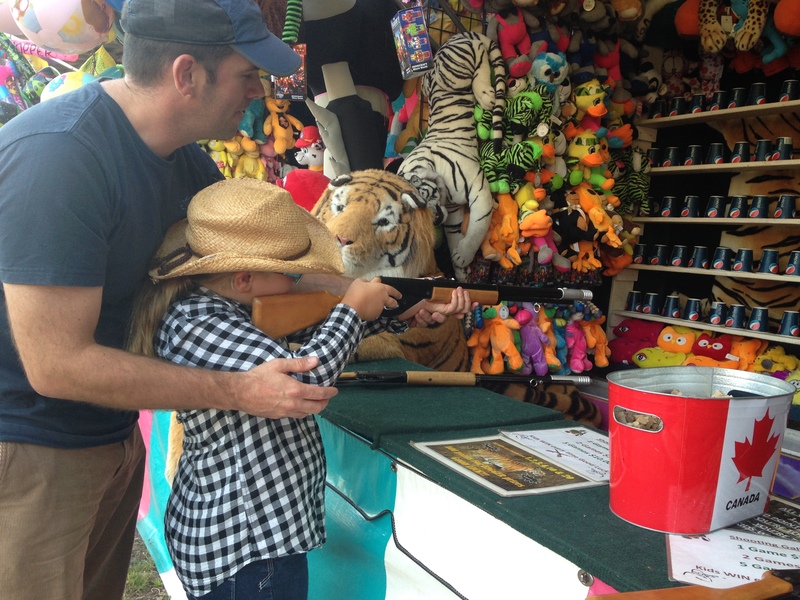 We also had the chance to take them to the Gagetown Fair a couple of weekends ago. 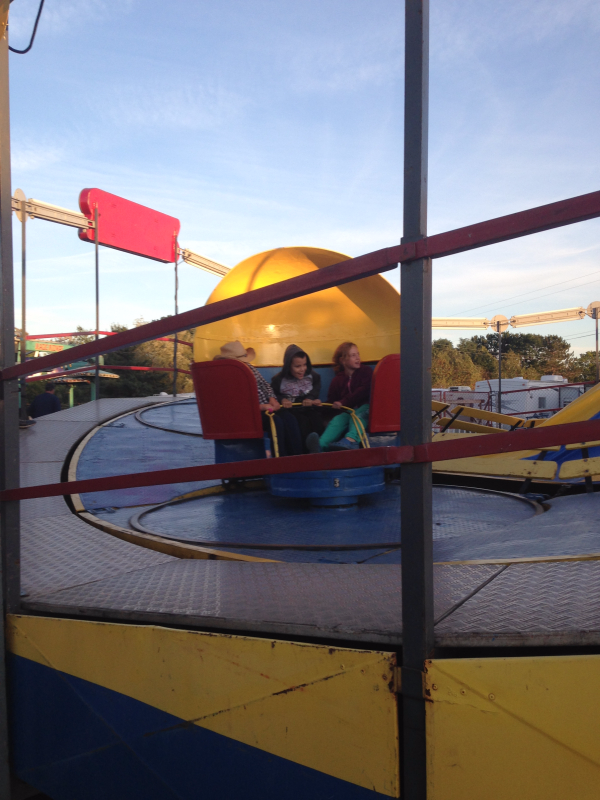 The fair has lots of events, including rodeo type competitions, animal judging, and of course fair type rides. It was our first year this year at the event. The girls came home from school and said 'everyone' was talking about going to the fair on the weekend — so naturally, we found ourselves heading out. 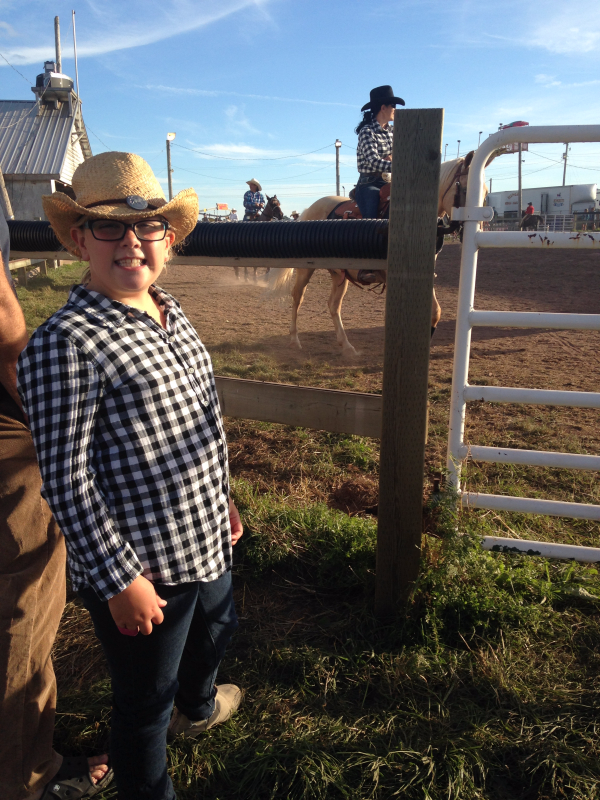 Here's Abby looking great with her Stampede hat from a couple of years ago. Aim before you shoot! Abby wanted to try out all the games. She actually hit two with one cork – a skill she'll have to teach us. Eventually, it was time to ditch their parents when their friends arrived. Once they did, both joined their schoolmates and ran around trying out different rides with them. Because it was one of their first times in memory doing these types of rides, they wanted to try every one of them — not realizing how their stomaches would feel afterward! 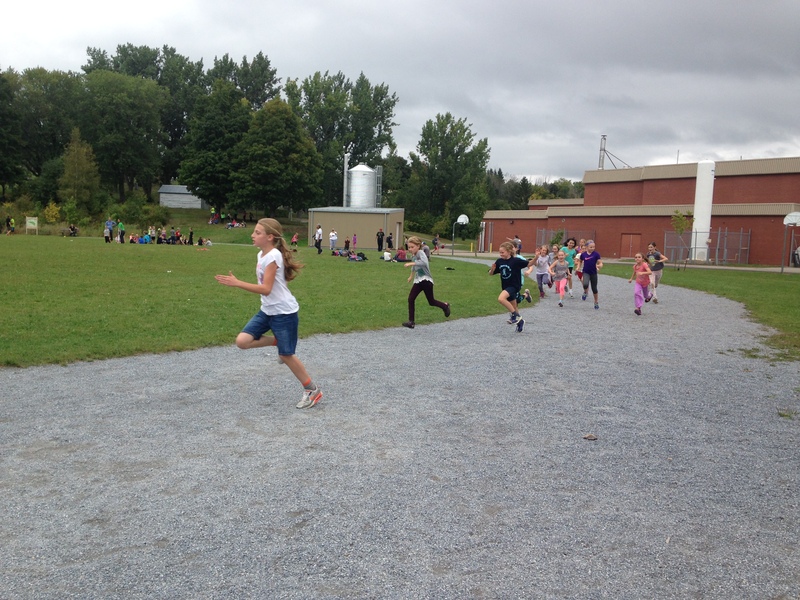 The schools are great in the area for hosting fun runs as part of their track and field. 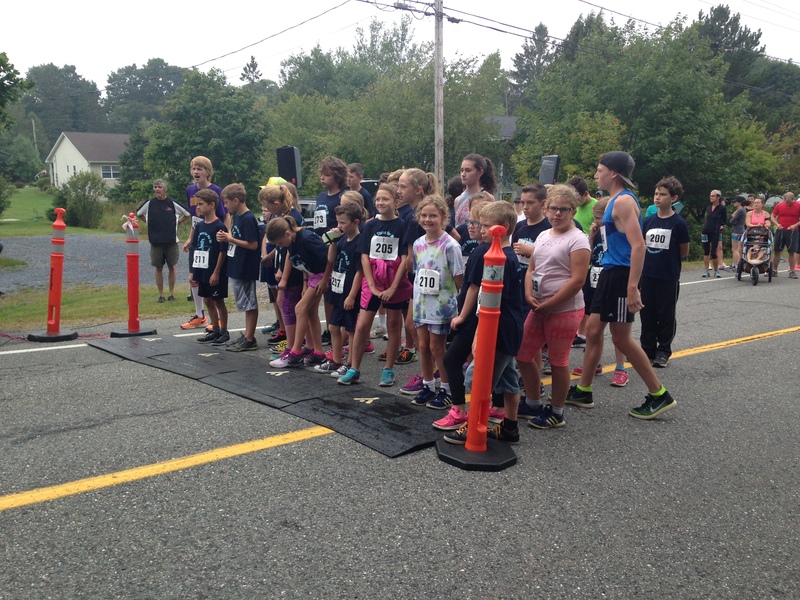 This past week, they were in Sussex for the school sponsored runs. Rebecca and Abby came in the same positions as last year — and were quite excited about it.